Der Artikel Georges Aperghis (geb. 1945): Contretemps für Sopran & Ensemble wurde in den Warenkorb gelegt. 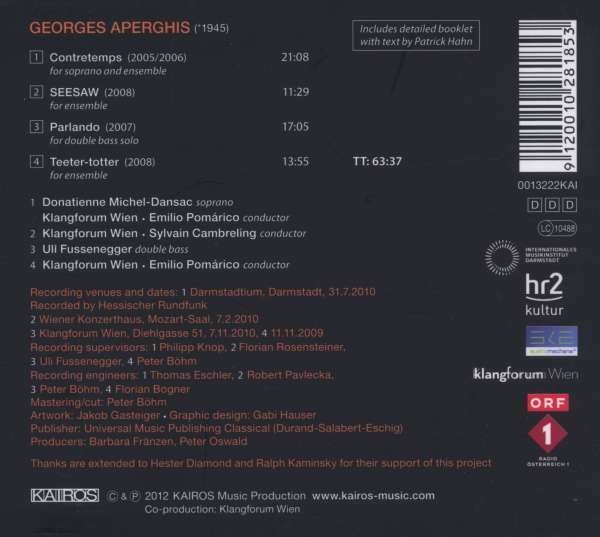 Georges Aperghis, who is known mainly as a man of music theatre, composes also “purely instrumental music” besides his spectacular theatrical works. He has been consistently producing arioso scenes for voice and ensemble, as well as chamber music. Over the past few years, this last area of his work has once again come into focus—and the present CD brings together three important pieces for ensemble from the past ten years. A highly virtuosic solo piece for double bass revolves around a motif which characterises Aperghis’ work overall: of music that speaks. In Contretemps for soprano and ensemble one can only guess at what the self-dialogues of the soloist might be about. 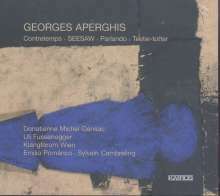 Georges Aperghis composes not only music as language, but also language as music. He starts from words or sentences, which he proceeds to fragment. “They are variations on themes which I destroy gradually, bit by bit, until one can no longer recognize them.” SEESAW refers both to the classic piece of playground equipment and to the associated up-and-down motion. Although Teeter-totter has essentially the same meaning, the expression “to teeter” can also mean to tilt back and forth uncertainly on an edge, entailing motion at a potentially life-threatening threshold. One could consequently surmise that, between the two types of motion in SEESAW and in Teeter-Totter, something ‘grows worse’. Conspicuous in SEESAW is the ensemble’s grouping in pairs, which allows “mirror-play” within the various individual timbres and parts.